A Nottingham institution Soulville sits just off Market Square on Queen Street and has recently also opened a second branch in Chesterfield. I had dined here many times in my student days with their two courses for £7.95 at lunch where I had several good experiences. 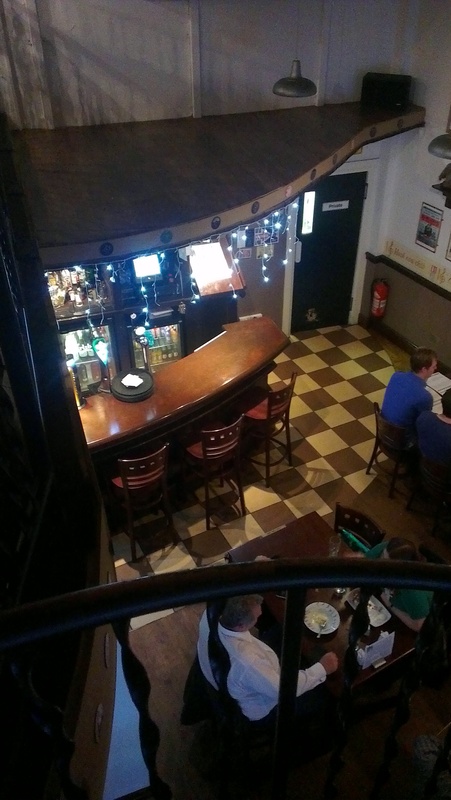 On this occasion I went with friends on a weekday evening, we actually failed to get in the week before (having not booked a table), a testament to its popularity. On the soul theme the restaurant tries to “recreate the spirit of the sixties” with artworks and music to match. Having perused the menu, deciding of course on a steak, we only had a short wait for our appetisers to arrive. Between 4 we had a good cross section of the menu; I ate barbeque ribs which had good meat that slipped nicely off the bone. The glaze/sauce however didn’t have the inherent sweetness that should go along with the smoke of BBQ. 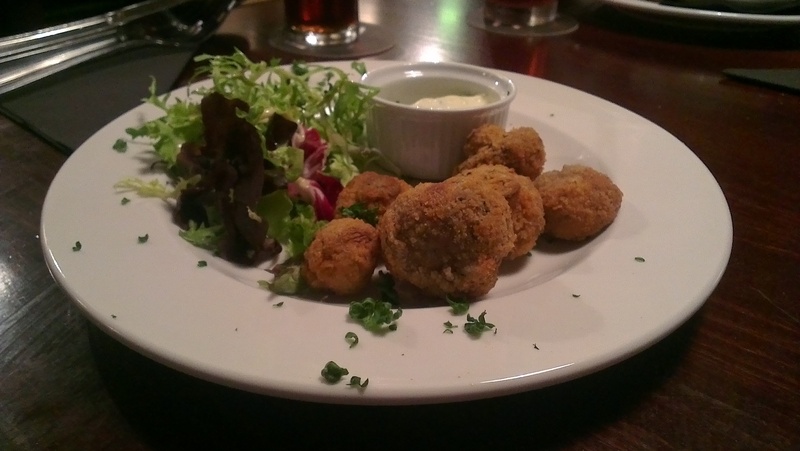 A few breaded mushrooms we thought rather bland and meagre which was surprising as two starters of Pepperpot Mushrooms and Pizza Bread were vast and had bolder flavours. There was certainly no shortage of peppercorns in the mushroom dish but that did leave the more subtle mushrooms struggling to compete. Starters ranged between £3-5 . 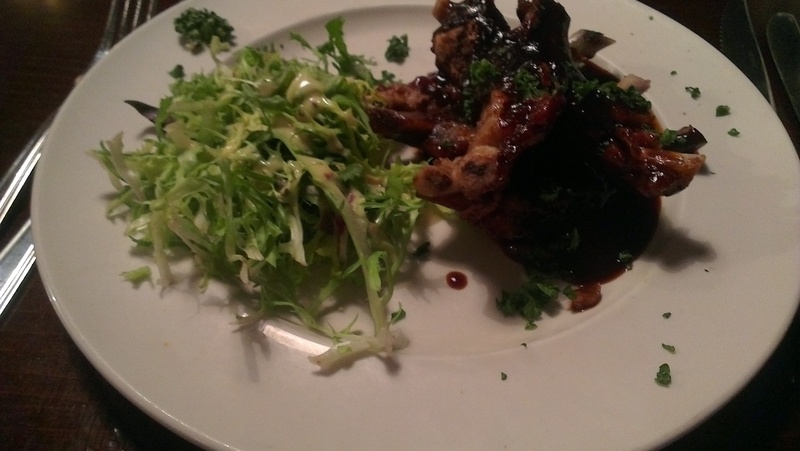 The centrepieces of the main course were two ribe eye steaks, both ordered rare. Once again with portions you are not left wanting. 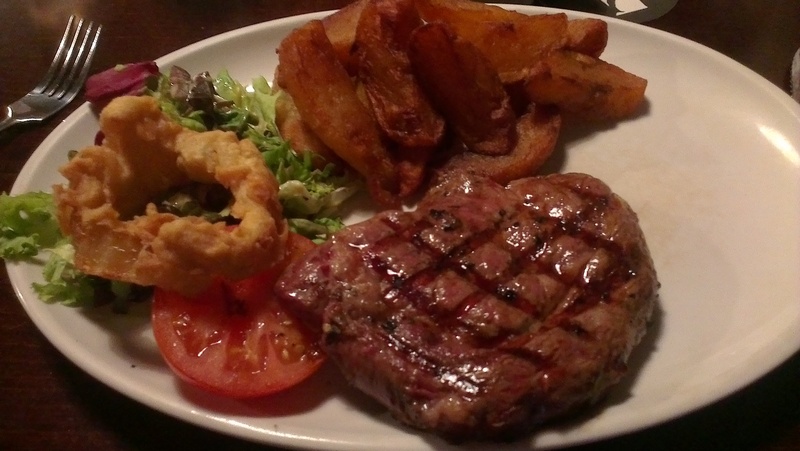 £12.95 buys you a 10oz steak with a choice of chips, mash or jacket potato along with salad, grilled tomato and onion rings. Despite myself and a friend ordering the same cut and level of cooking there was quite a difference in ‘rareness’. We actually swapped as my thought is usually the less cooked the better. However as I got through the meat the thicker sections were blue at most, a really great piece of meat could have carried the lack of cooking but this just wasn’t quite tender enough. I left the most undercooked pieces and amicably pointed this out when plates were being cleared. An apology ensued from the kitchen and was told if I had mentioned it earlier they would have “popped it back on for a few minutes”, which is nice to know. We also thought it good practice to try a sauce with the steak, a peppercorn one being ok and suspiciously similar to the Pepperpot starter. New Orleans chicken was an indulgent mix of bacon, cheese and BBQ sauce with the bird. Feta parcels were also good, served with a jacket potato so large I had to question whether it had been genetically modified in some way. With the amount of food already consumed we declined desserts although they do offer a number of classics including cheesecake and banoffee pie. I have had some enjoyable meals at Soulville but unfortunately this visit didn’t quite hit the mark. Value is good here and you won’t leave hungry but for quality I still favour the Larder on Goosegate as the best steak in Nottingham.